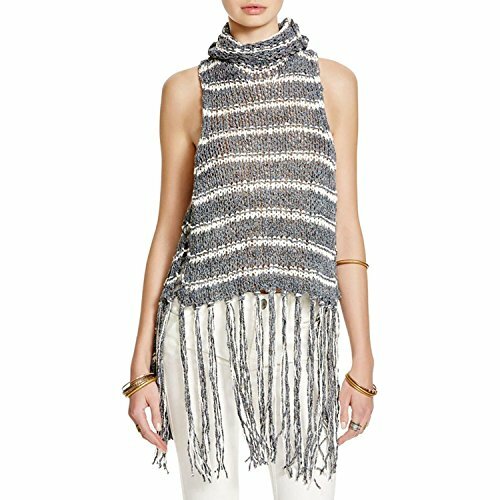 Free People Women's Size Guide A chunky knit sweater vest boasts simple stripes on a soft cotton blend fabrication. Extra long fringe detail at hem. Cowl neckline. Sleeveless design. Straight hemline at a cropped length. 83% cotton, 14% polyester, 3% polyester. Hand wash cold, dry flat. Imported. Measurements: Length: 30 in Product measurements were taken using size XS (Women's 0-2). Please note that measurements may vary by size. A chunky knit sweater vest boasts simple stripes on a soft cotton blend fabrication. Extra long fringe detail at hem. Sleeveless design. Straight hemline at a cropped length. 83% cotton, 14% polyester, 3% polyester. Hand wash cold, dry flat. Imported. Measurements: Length: 30 in Product measurements were taken using size XS (Women's 0-2). Please note that measurements may vary by size.